Kings Mills Antique Autos: Coming to Coney Mall in 2019! Kings Island's most beloved attraction, the antique cars ride, is returning to the park in spring 2019. In the new Kings Mills Antique Autos family ride, guests will board replica classic touring cars and take a leisurely drive around a scenic track equipped with a small rail to keep the car on the path. The ride will be comparable to the original Les Taxis antique car ride, combining nostalgia with new enhancements. Kings Mills Antique Autos will be located in Coney Mall, across from the Juke Box Café and alongside The Racer roller coaster. The ride will be a quarter mile in length and last approximately three minutes. The cars are 2/3 scale replicas of the 1911 Ford Model T; though all-new, they will retain the vintage feel of the original Les Taxis. The ride's name, as well as theming throughout the attraction, is expected to enhance the nostalgic experience for riders. I knew as soon as I heard something old is new again on the news the day before the announcement that it was the antique cars. They should never have taken them out. Not disappointed to see peach basket gone. Nearly impossible to win on that thing. Looks like things are moving fast. Good to have the old cars back. Now they need to bring back the sky ride. I agree, Mr. Roberts. We really enjoyed it. It's not like they're going to introduce a new Peanuts themed Enchanted Voyage, so really, a Sky Ride is all they have left, unless they decide to go with a few flat rides, like a new Rotor or Bavarian Curve. Personally, I wouldn't mind coming across a Butter Cup ride. I remember that being great fun. No, they won't fix what isn't broken, Mr. Roberts. Saw today they received the award for best children's area in the world again. It is nice. I think they could use more flat rides for people who don't like coasters or who aren't able to ride them. Personally I still miss the animals and monorail. They sell collector pins at the park, they're like trucker hat pins or lapel pins, they're made of metal with acrylic paint. This year they had a Lion Country Safari pin and it was the first one that I bought. I try to collect them from the places I go. Kings Island has pins of current rides like Banshee and Diamondback, but they always throw in a few retro rides each year as well, like Screamin' Deamon, King Kobra and the American Eagles. I put off getting The Vortex last year and the park was sold out of them by the second week this year. I'm kind of bummed I missed that one. Probably all bought up by a scalper because some guy is selling them on Ebay for $15.00 each. I'm not paying that much for a pin. But anyway, I was instantly excited when I saw the Safari and bought it first thing. Not sure but think we talked about the pins before, Mr. Roberts. I believe we have a bunch somewhere but don't recall specifics. No, I would not pay that much for one either, but glad you got the Safari one. I might try to check in with a few friends and see if they managed to get one or two, though for sure have no need for more stuff. Thanks for letting me know about this. 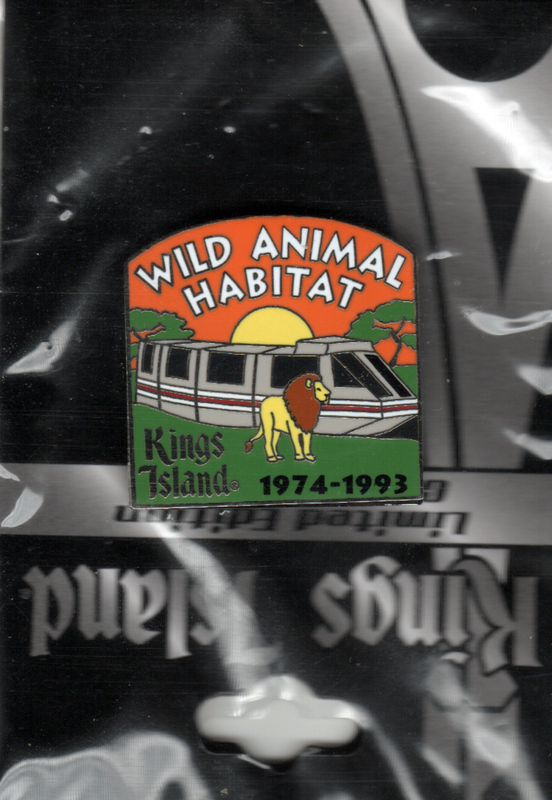 Here is the safari pin. Oh, very nice, Mr. Roberts. Thanks for posting. Hard to believe it's been gone since 1993. Doesn't seem that long. Wonder if it will be finished before winter sets in. Looks like they're making good progress. I have to say this looks odd to have equipment resting on the roof. I just read that they have completely re-tracked the turn around on the Blue Racer. I think the red needed it worse, but every little bit helps.